The city council of Portland, Oregon has voted unanimously to rename a street after slain gay icon Harvey Milk. The vote, held just two days before Portland’s Pride Parade, authorized the name change for a 13-block section of Southwest Stark Street. Southwest Stark Street sits in the center of the Burnside Triangle neighborhood, known as a largely LGBTQ district. While the area is still home to many LGBTQ businesses, much of the Burnside Triangle area has gentrified out of reach of the community, but this change symbolizes the districts history as well as the legacy of Harvey Milk. While Milk was not a part of Portland’s history, his place in history is felt worldwide. Milk was the first out, gay elected official to serve on the San Francisco Board of Supervisors. He also helped mount a successful campaign to stop Proposition 6 in California, otherwise known as the “Briggs Initiative.” That bill would have stopped LGBTQ people from being teachers in the state, and muzzled teachers from presenting LGBTQ issues. Milk and San Francisco Mayor George Moscone were assassinated by former Board of Supervisors member Dan White. The deaths, as well as the trial of White, spurred the community to action. This call to action is still felt today, and helped lead to the renaming of the Southwest Stark Street. A successful campaign to get the street renamed was mounted by local activists, who gathered over 2,800 signatures in support of the move. 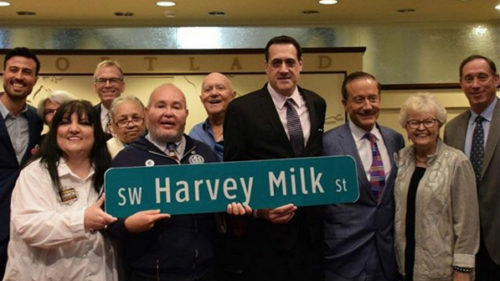 While city council votes are rarely “sure things,” the Portland City Council felt they could go out on a limb, sharing an already completed Harvey Milk Street sign after the ordinance passed. Oregon now joins several other cities that have honored Milk, including San Diego and Salt Lake City. San Francisco has also recently renamed a terminal at San Francisco International Airport in his honor.